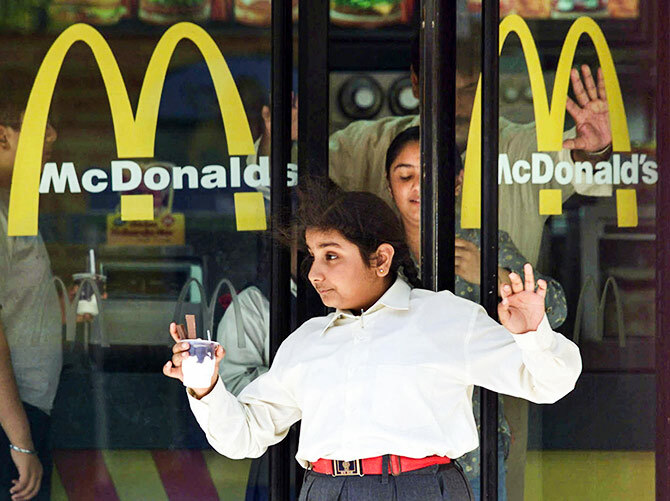 Rediff.com » Business » Can McDonald's get the love back in north and east? Can McDonald's get the love back in north and east? While consumers may have ignored the legal battles plaguing the franchise in north and east India, closure of restaurants is not something they are likely to ignore. IMAGE: A McDonald's outlet, with its shutters down, in Noida, Uttar Pradesh, outside Delhi. Photograph: @costlylovewins/Twitter. Caught in the bitter bickering that has engulfed Connaught Place Restaurants and the US headquarted McDonald’s, how does Brand McDonald’s hold on to its turf in India? By keeping the customer out of the fight, say experts. That is what Vikram Bakshi, reinstated managing director of CPRL said in an interview, soon after the court ruled in his favour, that he hopes to do at the earliest. 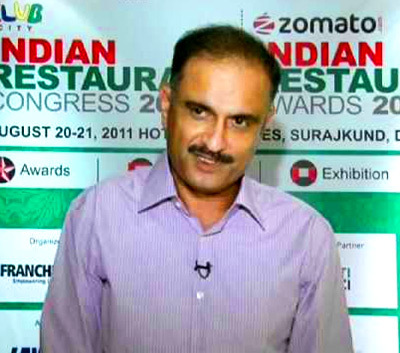 IMAGE: Vikram Bakshi, re-instated MD, Connaught Place Restaurants, the franchisee for McDonald's in north and east India. Photograph: Franchise India/YouTube. The series of events that have unfolded over the recent past has grabbed customers, who were thus far unaffected by the growing rift between McDonald’s USA and its franchisee for north and east India, CPRL. But with nearly 80 per cent of the stores closed, the impact of the over-a-decade-long battle hit close to home when many customers found the shutters down on their usual haunts. This could drag the brand into a negative loop, say experts, unless the company steps in to keep the brand out of the battlefield. The closure of restaurants may have its roots in technical issues, such as renewing mandatory regulatory health licenses to run the food retail business. But “when such incidents happen, consumers take cognizance of the matter. They identify something is wrong with the company,” says N Chandramouli, CEO TRA and the man behind Brand Trust Report. The recent incidents roll back to a battle that began in 2013. CPRL, a 50:50 joint venture between hotelier Vikram Bakshi and his company Bakshi Holdings and McDonald’s India, was formed in March 1995. While the differences between Bakshi and his US partners may well have begun soon thereafter, the dirty laundry was first aired in August 2013. One day, seemingly out of the blue, McDonald’s USA announced that Bakshi’s term as the MD was over. 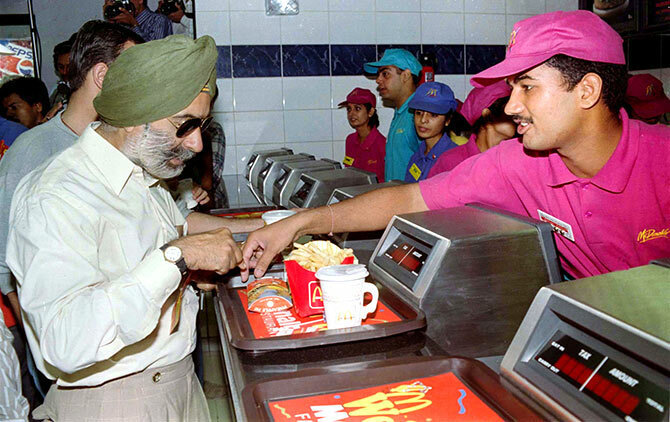 IMAGE: A Delhi-ite buys a happy meal from the first McDonald's outlet in India in New Delhi, October 13, 1996. Photograph: Stringer/Reuters. Ever since the two have been at loggerheads, disputing the terms of a settlement. But the burger brand has flourished, nevertheless. For one, the promoter infighting did not spill out into the restaurants and thus did not directly impact the customer-brand relationship. Besides, the embattled franchisee did not control the markets in the west and south where brand visibility and reach went up steadily. Everything changed when the stores began closing down. “It creates a very negative impression in the minds of consumers. A brand like McDonald’s has consumers belonging to all sections of the society. So, it is important that they act on it quickly and ensure reopening of outlets,” said brand consultant Harish Bijoor. According to him, regaining consumer trust won’t be easy. He sees the impact of the current events lasting a long time and believes the company would need to reassure customers about quality standard and focus on improving its service to wipe off the negatives. According to K V Sridhar, who heads communication agency HyperCollective, while quick reopening of the outlets is a must, a localised ad campaign following the move may help. 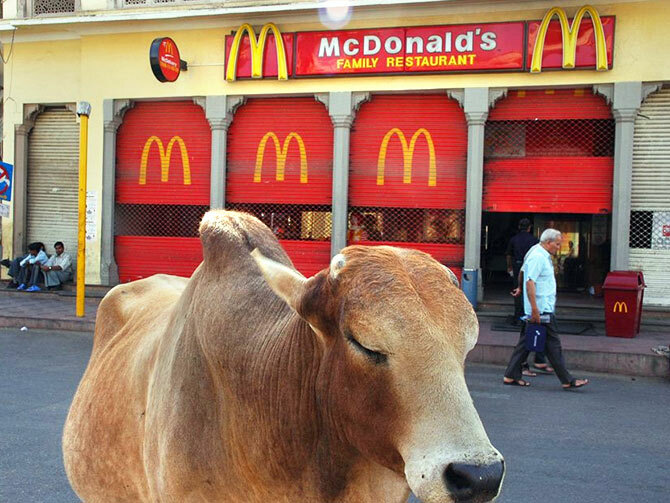 IMAGE: A young diner leaves a Delhi outlet of McDonald's. Photograph: Kamal Kishore/Reuters. The burger chain’s core customer group comprises millennials and Generation Z in India as in the rest of the world. The 390-million-strong generation Z (people born on or after the year 2000) has virtually grown up with the brand that came into the country in 1996. Considering that around 440 million-odd millennials are also its avid consumers, McDonald’s brand equity is heavily dependent on the young. As a consumer group, research reports say, the young are particularly fickle with their choices. Add to this the growing concern over health and wellness among this community, the brand has a tough fight ahead. The legal entanglements that the brand is caught in today are tough to untie. Bakshi approached the then Company Law Board in September 2013. McDonald’s went to the London Court of International Arbitration a month later and the two dragged each other into several other legal issues in years that followed. The matter has also been fought in the Delhi high court and the Supreme Court over the past four years. Since Bakshi’s ouster in 2013, a four-member board has been in place to run CPRL. An equitable representation of both the parties made it impossible to reach any decision. While Bakshi and Bakshi Holdings are represented by Bakshi and his wife Madhurima Bakshi, two nominee directors Robert Dale Larson and Ayesel Melbye represent McDonald’s India. IMAGE: McDonald's outlets in west and south India were unaffected by the Bakshi-Mac spat because the franchisee is not the same in these regions. 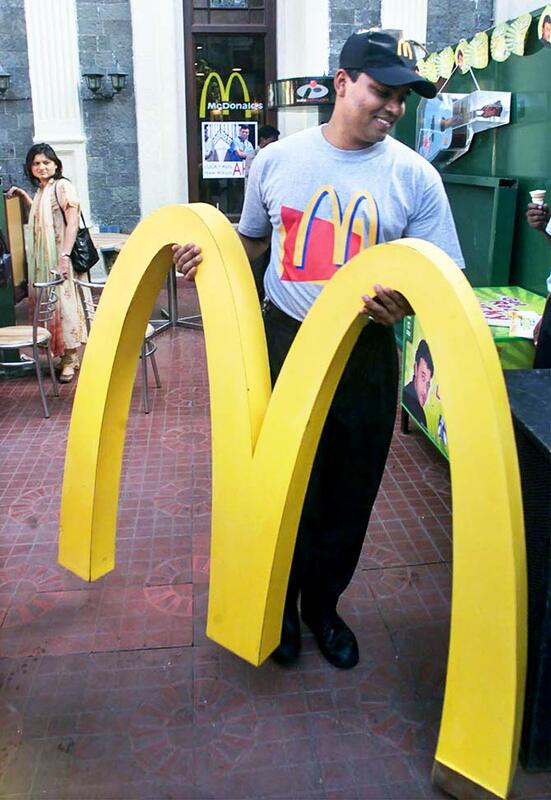 A worker carries the famous golden arches in front of a McDonald's restaurant in Mumbai. Photograph: Savita Kirloskar/Reuters. The impasse not only dented growth prospects, but according to sources, also led CPRL on a downhill ride in terms of quality of service and maintaining hygiene in its outlets. While the firm opened 27 outlets in 2012, in 2013 the number went down to 13. And in 2015, it opened just six percent of the planned number of outlets, three out of 50. While consumers may have ignored the legal battles, closure of restaurants is not something they are likely to ignore, says Chandramouli. “When such mass closures take place, it does impact the brand and consumers get disappointed.While one of the consequence is the company loses business to its competition, it also loses trust of its customers,” said K V Sridhar, ad guru who has played a key role in McDonald’s ad campaign called Hole in Shoe in 2005. Getting the love back, if the brand lets things slide, is not going to be easy.